Silver prices have now traded sideways for around 16 months. The lower end of this trading range is $27.00/oz and the higher end is $35.00/oz. As of today the price stands at $29.33 having bottomed at $28.50, it’s taken 4 trading sessions of small but positive gains to reverse the downward spiral from $32.00/oz. Not much to write home about here, but it is encouraging that the carnage is showing signs that it might be over, for now at least. It could of course be a relief rally with more downside selling pressure waiting in the wings a little further down the track. Either way we are still a long way down from the heady days of $48.00/oz. 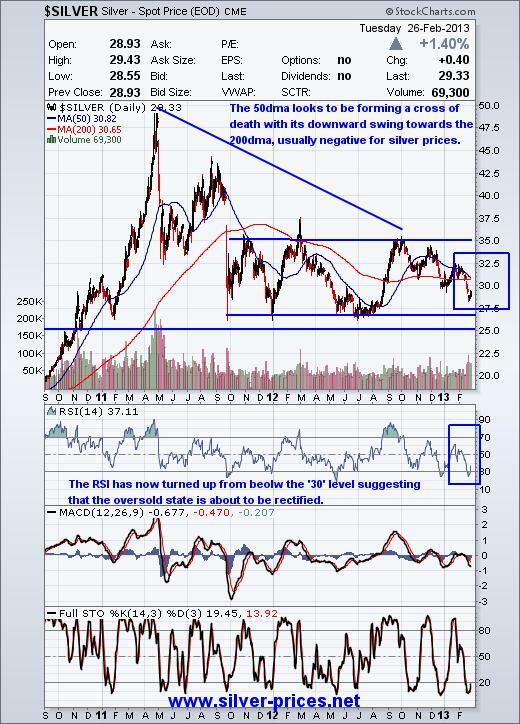 On the positive side the latest pronouncements from Ben Bernanke helped both gold and silver to rally along with the stock market in general. We have also had elections in Italy which appear to have resulted in gridlock with no political party able to govern without forming a coalition. The emergence of a clown known as Beppe Grillo has stunned everyone by capturing 25% of the vote. As we see it Italy will be back to the polling stations within 3 months in another attempt to resolve this situation. Also worthy of note was that the technocrat from Europe, Super Mario Monti, only managed to get 10% of the vote. This is a real blow to the policies of austerity and puts a question mark over Italy’s appetite to stay the course of reform and hardship. With debts 10 times the size of that of Greece it is difficult to see how a bailout for Italy could materialize and so the possibility of a default casts its dark shadow over the Eurozone. Over in the UK we see that, not before time, their AAA status has been reduced which in turn will make borrowing a tad more expensive in future. This is something that the UK could do without as it is shouldering so much debt at the moment and it too continues to print more money. Back in the States the question of whether to impose sequestration or not has to be resolved by Friday, so all eyes will be focused on the outcome. However, even if it is implemented in full, it only slows the rate of spending; it does nothing to prevent the debt from climbing. In conclusion we can say that our political masters and administrators will continue to try and print their way out of trouble and sooner or later inflation will follow. Once it raises its ugly head paper currency will be recognized for what it is and the herd mentality will kick in via a rapid charge to the exit. At that point gold and silver prices will be at new all-time highs and heading north. Taking a quick glance at the chart we can see that silver is range trading and the longer this consolidation goes on the bigger the move when it finally happens. Also note that the RSI and the STO have turned and are heading north from a very low level, so they have plenty of room to move to the upside. For now it is a case of sweating it out, doing the work and proceeding with great caution once you have identified an opportunity that fits your unique investment criteria.